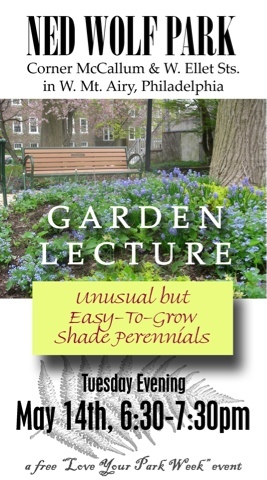 Join us on Tuesday, May 14 at 6:30 PM for a highly interactive lecture about plants to grow in the shade. Janet Novak and Eric Sternfels will be hosting this Garden Lecture at NWP. It's timed to be included as one of the City's Love-Your-Park-Week events. We'll talk about at least 10 lesser known shade perennials and we'll have a pot of each plant to raffle off at the end of the evening. We hope you can attend! Plant sale postponed to May 12!